TORONTO (May 9, 2013) – The National Hockey League Players’ Association (NHLPA) announced today that centre Sidney Crosby of the Pittsburgh Penguins, right wing Alex Ovechkin of the Washington Capitals and right wing Martin St. Louis of the Tampa Bay Lightning have been nominated as finalists for the 2012-13 Ted Lindsay Award. The Ted Lindsay Award is presented annually to the “Most Outstanding Player” in the NHL, as voted by fellow members of the NHLPA. Crosby, Ovechkin and St. Louis are all previous recipients of the “Most Outstanding Player” award, and this group of finalists will have received six of the last nine awards, including this season. 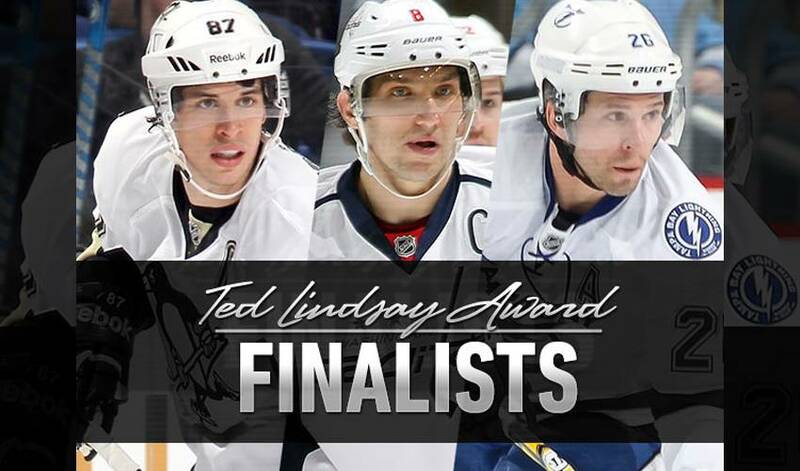 The 2012-13 Ted Lindsay Award recipient will be announced during the 2013 Stanley Cup Final. Sidney Crosby, of Cole Harbour, NS, Canada, appeared in 36 games for the Pittsburgh Penguins in the 2012-13 regular season, and helped lead the Penguins to first place in the Eastern Conference. He ranked tied for third in the league in points (56), second in assists (41), fourth in plus-minus (+26), and first in points per game (1.56). This marks the second year in a row that a Penguins player has been nominated, after Evgeni Malkin received the 2011-12 Ted Lindsay Award. Crosby is vying for his second “Most Outstanding Player” award. He received the players’ award in 2006-07 and was also a finalist in 2009-10. Alex Ovechkin, of Moscow, Russia, appeared in all 48 games for the Washington Capitals in the 2012-13 regular season, and helped lead the Capitals to a Southeast Division title. He led the league in goals (32) to win his third “Rocket” Richard Trophy, tied for third in the league in points (56), tied for fifth in points per game (1.17) and ranked first in power play goals (16). Ovechkin is vying for his fourth “Most Outstanding Player” award. He previously received the players’ award in three consecutive seasons (2007-08, 2008-09, 2009-10), and he was also a finalist in 2005-06. Martin St. Louis, of Laval, QC, Canada, appeared in all 48 games for the Tampa Bay Lightning in the 2012-13 season. He led the league in points (60) to win his second career Art Ross Trophy (2003-04), ranked first in assists (43), second in points per game (1.25), and fifth in power play assists. This marks the third consecutive year that a Lightning player has been nominated, after St. Louis’ linemate Steven Stamkos was a finalist in each of the previous two seasons. St. Louis is vying for his second “Most Outstanding Player” award. He received the players’ award in 2003-04.